Saturday, 12:00 p.m. ~ Chris’s team won their basketball tournament this morning and will play in the championship on Monday, Gideon’s birthday. Now it is on to the first part of Gideon’s weekendlong celebration, beginning with pizza and the zoo with Chris’s family. Sunday, 2:00 p.m. ~ The kids are both asleep and Chris and I are in concentrated don’t-mess-with-me or waste-my-time-with-small-talk-or-jokes birthday planning MODE. Well…I am. I keep trying to pretend like I’m light-hearted and not tense, which translates into something like “Woohoo! Isn’t this fun? !...don’t talk to me! !” Chris is filling up the helium balloons (very slowwwwwwly while watching a basketball game), and I am icing the cake and cupcakes and preparing all the food for tonight’s party. We have to finish these tasks and have the house cleaned and decorated before Gideon wakes up! I want him to come downstairs to a transformed house…a birthday wonderland! 2:20 p.m. ~ I just finished the cake, as well as one more minor breakdown. 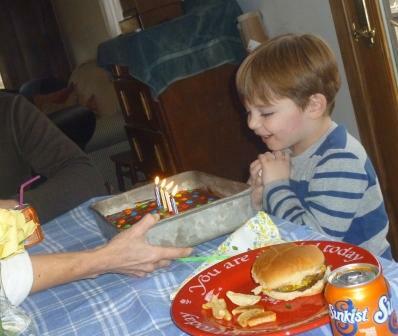 It came as I put the last M&M in place on the #4 on his birthday cake. That number was just staring at me in its primary-colored boldness, taunting me with its harsh and rigid lines, saying “Nanny, nanny boo boo, Gideon is four!” and I burst into tears at its candy cruelty…I much preferred last years’ graceful and whimsical #3. 4:30 p.m. ~ My feet are dying, but it is so worth it. The house looks amazing and there are balloons everywhere. Mrs. Gore has decided that a child’s birthday without balloons is just a day. Gideon is ecstatic with the results, which is really all I cared about. Next to impressing all the guests, that is. 7:00 p.m. ~ I actually made it to church this year with everything done ahead of time. We’ve invited everyone present at tonight’s service to join us in a little birthday party at our house. Hope we all fit! And I hope someone is willing to periodically climb those stairs for me to check on all the kids that are sure to be upstairs…after church this morning and party preparations this afternoon, I don’t think I’ll be physically able to do so myself! It is Mrs. Gore's greatest honor to be this boy's annual cake-bearer. Monday, 8:00 a.m. ~ His actual birthday is here! 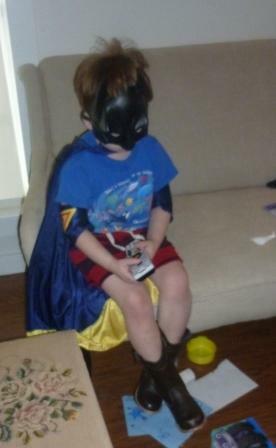 Gideon Michael Gore is 4 years old. He got to have a rare sleepover in Mama and Papa’s room last night, sneaking downstairs at our instruction after Rebekah fell asleep, and then reading books and talking until we were all too tired to keep our eyes open. 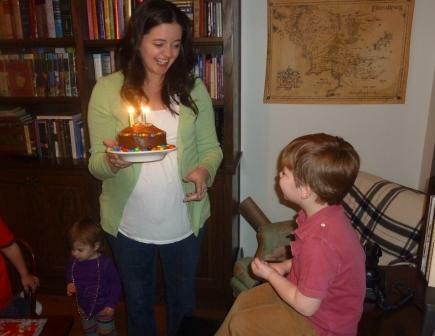 Today we’re trying a new birthday ritual…just us, just doing whatever things make Gideon the happiest. I haven’t been this excited since Saturday night! The best things in life are FREE...like birthday sleepovers!! (Make-overs, unfortunately, are not). 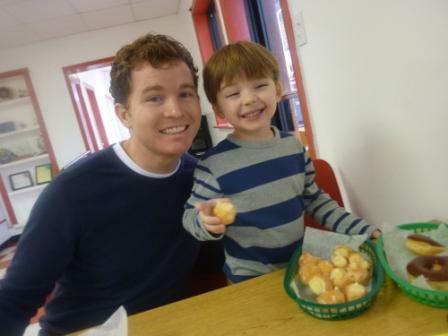 10:00 a.m. ~ We dropped Rebekah off at Grandmother’s house and have surprised Gideon with breakfast at the donut shop. 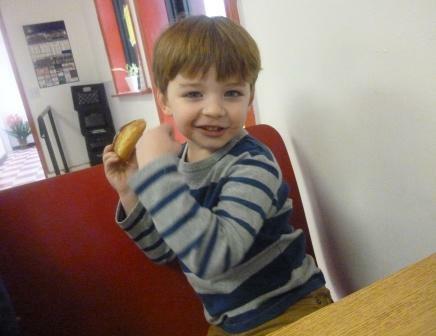 So far, he has devoured two chocolate donuts and a half a dozen donut holes. 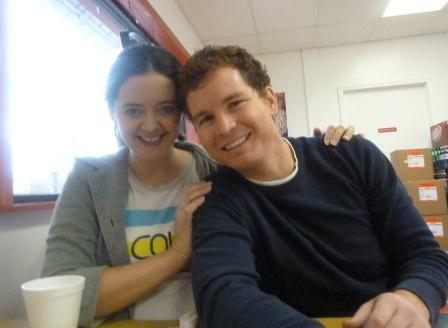 We also let him take as many pictures of us on the digital camera as he wanted…I’m sure they’ll be quite beautiful. We could probably stop here and say this was a successfully fun birthday! Only birthday boys get to eat that many donuts. And their pregnant mothers. 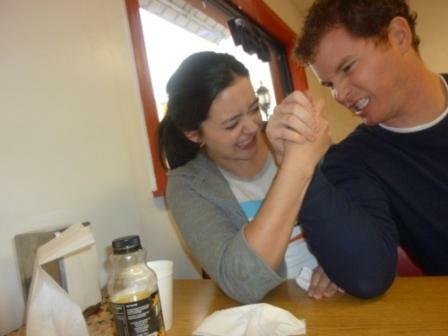 Picture #2 ~ "arm wrestle!" said the photographer. 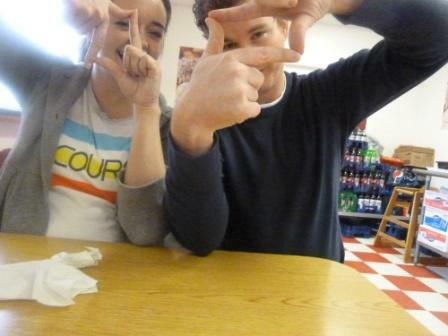 Picture #3 ~ "now make shapes!" 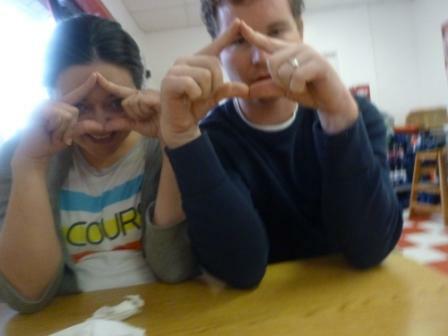 Picture #4 ~ "now make more shapes!" Turning 4 and eating lots of donuts give a boy some big ol' muscles. 11:00 a.m. ~ We stopped at the park to play, but because of the surprisingly chilly weather, only stayed for about five minutes. A combination of corduroy and raindrops caused Gideon to shoot down the slide like a torpedo, depositing him in the pebbles in a daze and giving at least two of the three of us a good laugh (hint: Gideon wasn’t crying...). 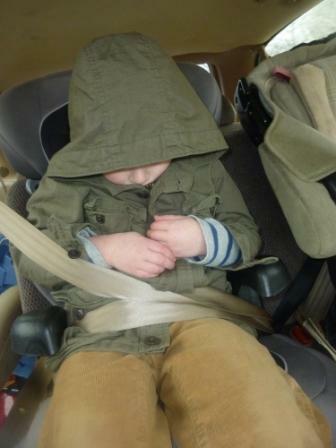 He and his wet bottom have requested to go somewhere “warm and cozy,” so we’re off to the Wal-mart toy section! 12:30 p.m. ~ We played with every toy in Wal-mart, namely, the Nerf weapons…swords, hatchets, axes…thankfully Mr. Gore had enough energy for the both of us and waged a 40-minute battle against his son, running down aisles, hiding and jumping out like a crazed Barbarian maniac, engaging in dramatic sword fights…basically, giving Gideon the time of his life. (Will Papa be so eager to go to the toy section to play Barbies and baby-dolls come Rebekah’s next birthday?…Probably.) We even let the birthday boy ride a motorized 4-wheeler all through the movie section (who cares if it was pink and purple and made for a 2-year old? It’s Gideon’s birthday!!!). And the best part is, we were there for at least an hour and only spent $10, not on toys, but on a bouquet of tulips for our beloved baby-sitter. Speaking of that great lady, we have come back to Grandmother’s house where a delicious lunch awaits us of Gideon’s favorite things: strawberries, watermelon, yogurt with M&M’s in it, hamburgers, french fries, chips and cheese dip, chocolate cake and tiny cans of Sunkist. Have I mentioned that my Mom knows how to throw a party?? The next best things in life are relatively cheap...i.e. candles. We have as many candle-blowings as possible. 2:00 – 4:00 p.m. ~ The entire family is unconscious. Birthdays, even “the simple kind” are exhausting. 5:00 p.m. ~ We’re on our way to Papa’s basketball championship, where Gideon will get to run wild with all his nursery friends. 7:30 p.m. ~ Run wild they did. And our church won the championship! So now Papa will still be happy to celebrate Gideon’s birthday!! 7:31 p.m. ~ Gideon is overwhelmed, after trying to give his cousin Anna her beloved toy Batman back, to find that when she gave it to him, it was for keeps. She loves him very much. I think he knows it now. 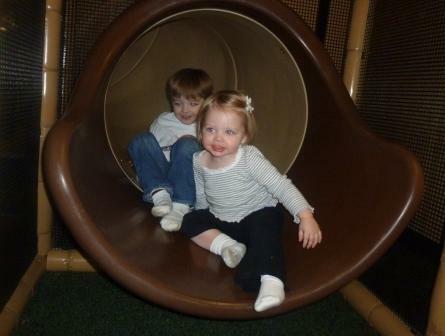 9:00 p.m. ~ Gideon, his sister, his cousins and his friend just had a good, long play in the Chick-fil-A playground. I didn’t even make him finish his food. He just played and played and played and played and played and he and his diehard slide-till-she-drops (which she never does) sister shoved their leftover chicken bits in their mouths allllll the way home. And that’s a wrap! I just have to add that it seemed the whole world celebrated with us on this relaxing and unscripted day – Grandpa’s prize colt was born that same morning (Gideon has requested that Grandpa name it “Drink” or “Fan Light”), and everytime we drove by the big dump truck on the highway going to and from our different excursions it was dumping a huge load of dirt. Believe me, on a normal day, that never happens! March 14th was Gideon’s day, through and through, as well as the days surrounding it. I can’t think of one thing I would change. That thrills my heart to hear that. Thank you! This is how we do birthdays around here. I just HAVE to celebrate on the actualy day….which means big parties are often out of the question.. So we scrapped those and just spend their actual birthday celebrating from sun-up to sun-down. It’s pretty sweet if you ask me! 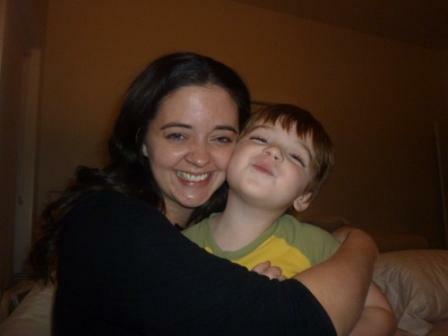 And I cry as they age as well…..which means when Cambrey turns TEN in August, I might actually die of a broken heart. I refuse to believe that Cambrey is turning ten. No way, no how. Do you want me to sing at your funeral?